We’d love your help. Let us know what’s wrong with this preview of Red Is for Rookie by Anne Greene. A kidnapping. A ticking clock. Three hot PI’s. A Black Widow kills again. Will Holly’s first case end in disaster? Will the two men in Holly’s life give her too much heat? Motivated by the murky circumstances surrounding her father’s reputation-ruining murder, Holly vows to clear his muddied name, prove herself as a PI, and redeem Garden Investigation’s integrity and dwind A kidnapping. A ticking clock. Three hot PI’s. A Black Widow kills again. Will Holly’s first case end in disaster? Will the two men in Holly’s life give her too much heat? To ask other readers questions about Red Is for Rookie, please sign up. One of my favorite types of books, a cozy mystery with lots of romantic suspense, I thoroughly enjoyed Anne Greene's first book of the Handcuffed in Texas series. An over-the-top Valentine's banquet for rich, young professionals provides the start for this fast paced book which takes off with a sudden bang and never slows down. Holly Garden, the hapless heroine, is serving security at said banquet when her best friend is kidnapped. Holly has her work cut out for her. She must Definitely a Winner!! Holly has her work cut out for her. She must fight the police department's animosity towards her deceased father and clear his tarnished name. She must figure out whether handsome Stryker is for or against her. Holly also needs to convince her uncle that she can find Matt faster than her rival at the family detective agency. Last but not least, Holly needs to survive while doing all this. I really enjoyed this fast-paced tale of twists and turns.The references to Scripture and the some of characters' solid beliefs were encouraging or convicting. At one point Temple says,"I'm the daughter of the King...and so are you." " 'Take your pick.' Temple's tone indicated there was no contest between the choices." How true! We are who we think we are, just as the Bible says,"As a man thinks in his heart, so is he." A great cast of quirky characters, (gotta love Grandma! )fast adventure,some spiritual truths, and an ending that will leave you begging for the next book..definitely a winner!! In the same vein as Janet Evanovich's Stephanie Plum series, Anne Greene has given readers a cleaner, southern hospitality of Holly Garden, PI. This contemporary mystery incorporates the elements of action, intrigue, comedy and romance, and all with the underlying theme of how Christian faith is essential to keep going. Hollyhock Garden has a keen investigative mind, and a strong devotion to her Christian faith. She is not above admiring a hunk or two with her best gal pal or her Granny, but they all pray together - and carry big guns - naturally with legal conceal carry permits. Her mother worries about her being in such a high risk profession, and trusts her own payments to a competing agency to keep Holly safe - whereas granny trust God and prayer - as well as the Glock Holly carries, and th Hollyhock Garden has a keen investigative mind, and a strong devotion to her Christian faith. She is not above admiring a hunk or two with her best gal pal or her Granny, but they all pray together - and carry big guns - naturally with legal conceal carry permits. Her mother worries about her being in such a high risk profession, and trusts her own payments to a competing agency to keep Holly safe - whereas granny trust God and prayer - as well as the Glock Holly carries, and the 38 Granny herself carries. I never spent much time in Texas, but I would like to spend more time in this Texas neighborhood, to get a chance to know Holly, her crazy family, and her hunky co-workers better - and I only have to pick up my Kindle Unlimited again to read more! Holly Garden, P.I. : Red is for Rookie by Anne Greene is a fun, entertaining, and original romantic suspense story that I thoroughly enjoyed and recommend. Twenty-four-year-old Holly suffered a major, regrettable setback to her P.I. career when her father with whom she was working on a case was killed. The police department among others believe her father was corrupt, and she vows to clear his name and to restore his sullied reputation. The only problem is that there is no one in her family (her Holly Garden, P.I. : Red is for Rookie by Anne Greene is a fun, entertaining, and original romantic suspense story that I thoroughly enjoyed and recommend. Twenty-four-year-old Holly suffered a major, regrettable setback to her P.I. career when her father with whom she was working on a case was killed. The police department among others believe her father was corrupt, and she vows to clear his name and to restore his sullied reputation. The only problem is that there is no one in her family (her mom and her uncle who now runs the investigations office) who has confidence in her abilities or approves of her career choice—except her devoted grandmother. The story begins with Holly and her team working security at her mother’s Valentine Meet-a-Thon event. Early in the evening Holly discovers that her mom actually hired back-up for their team, proving that she has little confidence in their ability. Suddenly Holly is confronted with an extremely attractive and egotistical rival P.I., and soon after, is blind-sided by a master-mind abduction of her friend and co-worker, Matt. Holly must quickly add up the clues to save Matt, if it is not too late already. Holly and Stryker, her rival, eventually team up to solve the case and to keep Holly and her family safe, plus their informant, Chuck, the professional wrestler/mechanic involved in the abduction, and a little girl whom Chuck had befriended. Yet, Holly discovers that Stryker is still on her interfering mom’s payroll, and that, to her, is a huge deal breaker. She strikes out on her own, dangerously alone. A great reading adventure, sure to satisfy a suspense-loving reader. I recommend this book which I received through TBCN in exchange for an honest review. Red is for Rookie is an entertaining romantic suspense book by Anne Greene. Fast-paced, lots of action (some of a bit comical) with an edge-of-the-seat climactic ending. Holly is a newbie PI and one of her best friends goes missing at a Valentine’s gala. Is it a kidnapping? Is it related to her what happened to her father? Will Holly be able to find him before he’s killed or before she herself is? Lots of twists and turns in the plot, one especially was a ‘wow, I didn’t see that coming’ scene. C Red is for Rookie is an entertaining romantic suspense book by Anne Greene. Fast-paced, lots of action (some of a bit comical) with an edge-of-the-seat climactic ending. Holly is a newbie PI and one of her best friends goes missing at a Valentine’s gala. Is it a kidnapping? Is it related to her what happened to her father? Will Holly be able to find him before he’s killed or before she herself is? Lots of twists and turns in the plot, one especially was a ‘wow, I didn’t see that coming’ scene. Characters are quirky and enjoyable to meet, one in particular, is Granny, the quintessential wannabe detective, reminiscent of Grandma Mazur from Janet Evanovich’s Stephanie Plum series. I liked how the author brings faith in God into the story with Holly reminding herself of God’s Word and His faithfulness to guide and protect. I enjoyed the book and am looking forward to reading more of Holly’s story and more of this author’s works. I couldn't put the book down once I opened it. Written in first person, this mystery takes the reader through a thorough day of a "green" PI. Holly is a strong woman who daily tries to protect her heart from getting hurt, AGAIN, and realizes that sometimes the Lord wants to use those emotions to draw out the best in her. The author does a marvelous job in making Holly a real person who tries to overcome her fears as she grows in her passion/career. I cannot wait to read the next one!!! Family can be a mixed blessing, incredibly helpful when supportive and incredibly frustrating when not. As our heroine knows first hand. This was an interesting read. Our heroine is new to the PI biz, but trying hard to prove herself and other things as well. The story features of host of characters, some likable, some not, but all with good solid backgrounds which make them real. And their interactions with our heroine certainly keep her on her toes. The story is well written with an intriguing Family can be a mixed blessing, incredibly helpful when supportive and incredibly frustrating when not. As our heroine knows first hand. The story is well written with an intriguing plot that has enough twists and turns to keep you guessing. There is also a fair amount of humor throughout to keep things light and entertaining. Overall, it made for a very enjoyable read. Trying to write tough language (without swearing), it starts out being quite messy. The story is also messy, with the unknown past, but it gets better and the end explains most (as it should). The characters are very good, and I like reading from the romantic female sleuth' perspective. Holly is a private detective who has several agendas. She is trying to clear her dad's name, find out who killed him and prove to her family that she can handle the job of being a PI and being able to protect herself. The action starts at a Valentine's meet party. Holly and her partner Matt are doing security for the party. Holly notices a group of men that look out of place and before you can blink an eye, chaos erupts. When the fighting and turmoil is over , Holly finds her partner hurt. She asks someone to call 911. Within minutes they arrive and she notices something doesn't feel right. Her partner is being stuck with a needle and rushed off in an ambulance. Holly can't find out what hospital Matt has been taken to and realizes something is very wrong. Before long , word has gotten back to Holly that Matt has been kidnapped . Why would someone want to kidnap her partner? The bigger question is who is Stryker? Why was he at the party as security also? I found the book to be a light quirky and funny mystery. Holly tried to put out a fire with a prime rib, she seems to always be just a few feet away from danger and she is hopelessly clumsy. Her character is very well written and centers on her faith. She has two men vying for her attention, but she is so distracted by the case, will she miss her chance at love? The story flows effortlessly and with action that keeps you glued to the pages. It is Valentine’s Day and Holly Garden is working security for her mother’s latest venture for the Dallas Ladies Auxiliary – a Valentine Meet-A-Thon. What she really needs is a real case; she works for Garden Investigations which is headed up by her uncle. And underneath all, she wants to solve her father’s murder and sanitize his reputation. During a commotion caused by a group of wrestler’s Holly’s partner and next door neighbor, Matt Murdock, is drugged and taken away by ambulance and another It is Valentine’s Day and Holly Garden is working security for her mother’s latest venture for the Dallas Ladies Auxiliary – a Valentine Meet-A-Thon. What she really needs is a real case; she works for Garden Investigations which is headed up by her uncle. And underneath all, she wants to solve her father’s murder and sanitize his reputation. During a commotion caused by a group of wrestler’s Holly’s partner and next door neighbor, Matt Murdock, is drugged and taken away by ambulance and another private investigator, Stryker Black, is knocked out under a table. Holly now has her real case – finding the kidnapped Matt – and figuring out how Stryker fits in to it all. You will enjoy Holly’s family – mother, grandmother and twin sisters – and Holly’s unconventional way of doing things. Through it all, Holly tries to exhibit a Christian witness to those around her. This is Book #1 in the Handcuffed in Texas Series. You will want to read more in this series of inspirational and romantic mysteries. I received a copy from the author and publisher by way of The Book Club Network in exchange for an honest review. This is a pretty good novel. It is written in the style of the Stephanie Plum series but Holly is a Christian. She works for her uncle's PI firm. She gets into all kinds of trouble, wrecks cars, etc. She has a sidekick for stake outs, a gun toting grandmother and a super hero kind of guy who comes to her aid. I was pleased that the novel was pretty well written and the characters well crafted. I recommend the novel to those who like the Plum novels but have been wanting something similar from a This is a pretty good novel. It is written in the style of the Stephanie Plum series but Holly is a Christian. She works for her uncle's PI firm. She gets into all kinds of trouble, wrecks cars, etc. She has a sidekick for stake outs, a gun toting grandmother and a super hero kind of guy who comes to her aid. I was pleased that the novel was pretty well written and the characters well crafted. I recommend the novel to those who like the Plum novels but have been wanting something similar from a Christian perspective. You can read my complete review at http://bit.ly/1HV0ux1. This was an exciting and enjoyable book. Holly was a young P.I. trying to solve her first major case, a kidnapping of her best friend. Through a comedy of errors and mishaps, she came up with a list of suspects. She is fighting relatives to keep her position as a P.I. and her father's rather poor reputation. Overall, it is a light fun read. I look forward to the next book in the series. I received the book from the Book Club Network in exchange for my honest opinion. 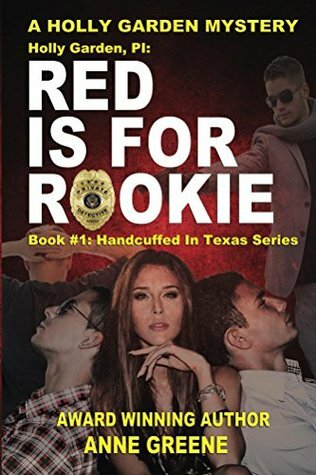 "Red is for Rookie," is book 1 of Handcuffed in Texas Series, written by Anne Greene. This is a very light, fast paced mystery. Poor Holly is such a sweet gal. But, things just seem to keep happening to her! She stumbles, quite literally, over things all the time. She desires to clear her father's name, to solve mysteries, to be a good friend and daughter, to be a good Christian, to keep her job, and yet, she often messes up. Sounds sort of...human. When Holly's friend Matt is kidnapped she is "Red is for Rookie," is book 1 of Handcuffed in Texas Series, written by Anne Greene. This is a very light, fast paced mystery. Poor Holly is such a sweet gal. But, things just seem to keep happening to her! She stumbles, quite literally, over things all the time. She desires to clear her father's name, to solve mysteries, to be a good friend and daughter, to be a good Christian, to keep her job, and yet, she often messes up. Sounds sort of...human. When Holly's friend Matt is kidnapped she is determined to solve the case. As she pursues one idea after another she gets into more hot water. Her mother wants her off the case, the police want to off the case. Does she listen? Of course not. With the many twists and turns, we finally find out who the kidnapper is, but can Holly stop him or her? Some of the themes in this book are child abuse, faith, and trusting God for the outcome. Greene's characters feel authentic and are easy to relate to. This is an enjoyable faith filled mystery. A nice and entertaining romantic suspense. The book is well written and engaging, I liked the setting and the cast of characters. Was happy to learn I had won a copy of this book to read. Sounded like a good one and I was right. Starts out with Holly and she and her best friend Matt, who are both PI's are watching over the night at the Meet and Greet Valentine's event that her mother had planned. Something goes terribly wrong and Matt is kidnapped. Holly finds the clues and pieces it all together after talking with a few hands full of people. There are so many to name but so easy to keep track of. With the help of God and her friends, family and suspects and cops she hopes to find the missing piece to the puzzle. Lots of action, bit of romance, finding clues and where to look for them and especially like the rules noted as they resemble ones from Gibbs NCIS TV show. Very entertaining story and can see another to make this a saga series. The door is open for all that and more. I was given the book by the author via Book Fun (The Book Club Network) and this is my honest review. Anne Greene is an award winning author.